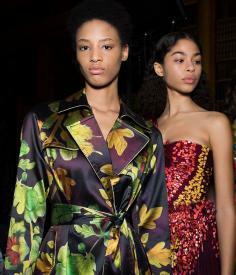 Scene setting: For the last few seasons, Peter Pilotto has brought a little pizzazz to its show proceedings, showcasing collections in legendary venues including Tramp nightclub on Piccadilly and Trader Vics, the Polynesian-inspired basement bar on Park Lane. For A/W 2019, Peter Pilotto and Christopher de Vos opted for the Reform Club, a member’s-only establishment which opened in 1836, and was one of the first of its kind to admit women in 1981. Inside opulent book-lined rooms, guests sipped champagne and munched canapés as models strode through the space, their dresses swishing on bold patterned carpet. Mood board: The plissé metallic dresses, floral silk jackets and lurex jacquard tuxedos evoked the iridescent and decorative designs of Hungarian Zsolnay porcelain. Colours were ethereal and dreamlike and sorbet shade dresses and blouses were layered with bands of lace and plumes of ostrich feathers. Like the historical splendour of the Reform Club’s rooms, the collection was decadent and harkened to bygone glamour. Tailored jackets and trousers in executive grey tones leant a touch of contemporaneity. Pilotto’s woman loves a posh party, but she’s heading to it after work.